Who am I? How do I express myself when there are more an more restriction on what I can wear when I go to school every day. I feel so oppressed. I need some kind of outlet to let everyone see that which is the marvelous me. If I can't do it through the words on my shirts, the color of my hair and the rips in my jeans then I will resort to the last bastion of expression for kids, my Backpack. Sure, you may call it a bookbag, a schoolbag, a napsack or a knapsack, it doesn't really matter what the name is. To me, it is a huge blank canvas ready to cover with the beauty of my creativity. After a few backpack crafts I can strut into those school halls and feel truly alive! You can just buy a plain backpack with a solid color background and make it stylish on your own by just adding cool buttons and pins. Buttons and pins can be found for all of your favorite bands, tv shows, web sites, drinks, food, etc. Amazon has a pretty big selection of pins - Cool Buttons and Pins - otherwise, a lot of clothing stores and accessory stores at the mall carry them. Another idea is to use stylish embroidered or cloth patches that either can be sewn on or ironed on. These look really awesome and really make any bag look unique. I found an online store called Laughing Lizards that has them, but you can also get them on Ebay, at Amazon or at your local crafts store. Sew On a Design or Your Initials with Beads - This isn't just for girls....this is a great way to sew on letters of your name or initials or a cool design such as a peace sign or the sun or even Pixelated Mario. Find out how to make this cool backpack with the following simple craft. How to Draw on and Paint Your School Book Bag / Backpack - In this crafts project, I drew and painted Lego Superheroes on my son's backpack. Bag The Books - Carry your books in style in your very own book bag. Jazz it up with bright colors and cool designs! Blue-Jean Book Bag - This quick sewing project makes it a cinch to turn old jeans into a rugged book bag. Create Your Own Backpack - Send your child back to school in style and help them express their creativity with this backpack craft. How to Decorate Your Own Drawstring Backpacks - Decorating your own drawstring backpacks is a fun and easy craft project. The best part of working with a drawstring backpack is that you have a clean canvas to manipulate any way you please. Let your personality shine through as you unleash your decorating and artistic talents on your backpack. 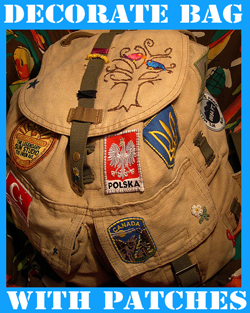 Once you get a hang of it, you can give your decorated backpacks as gifts to friends and relatives. Hot Rod Backpack Straps Craft - Some little guys we know don't like leaving their cars at home. Now they don't have to. Thanks to the miracle of Velcro, favorite vehicles can hitch a ride on kids' backpack straps, where they are both cool-looking and available for action. How to Decorate Your Backpacks - Nothing is worse than a boring backpack! Read this handy article to find out how to decorate your school bag to perfection with little to no effort at all! On My Back(pack) - Tote your books in a totally awesome backpack that you design yourself! How to Customize a Teen Backpack - Here are some steps and suggestions to get you on the road toward having a backpack that is uniquely your own! How to Decorate a Backpack With Duct Tape - How to Decorate a Backpack With Duct Tape. Buy colored or camouflage print duct tape as a departure from the typical silver. Trim and adhere it to the backpack to create cool patterns. Cut it into tags, add designs with markers and dangle them from the top handle. How to Decorate a Plain Book Bag - So you want a new backpack, but your parents say no. Here are some ways to make your boring bag into something cute! How to Decorate a School Bag - Travel to school in style with a backpack or tote different from any other bag on campus. Expect a lot of attention when you arrive in class carrying a bag decorated with dimensional embellishments, monograms and personal artwork. How to Decorate Your Bookbag - This is for kids who want to customize their bookbags in a cool way. This works well with white and black bookbags, but any color will work! Kids' Backpacks : How to Decorate a Backpack - Create an Original Kid's Backpack that Expresses Your Child's Personal StyleThe prototypal period of edifice is apace forthcoming and it's instance to encounter a kids packsack for your child. If last year's packsack is ease in beatific shape, provide the kids packsack a newborn countenance by decorating it. This is a recreation send to do with your female to support her intend primed for a newborn edifice year. Simple Tips for Giving an Old Backpack a Fresh New Look - Backpacks are on the list of "must have" school items and often are the most expensive item on the list. For families watching their budgets and trying to make do with the same backpack from year to year, there is a way to make last years backpack a bit more exciting for your child. 911 Angel Backpack Decoration - Our 911 angel decoration is just right for your key ring, your backpack or use it as a zipper pull. Backpack Danglers Crafts Activity for Kids - As any kid will tell you, there's no greater fashion faux pas than a naked backpack. So we devised these jazzy danglers to dress up even the drabbest canvas. You'll need to lay in some inexpensive supplies ahead of time, but once they're handy, your kids can whip up new danglers to suit their daily whims. We've described three methods below, but your kids will undoubtedly dream up their own. Backpack Flag - Go back to school with pride in the USA. Make a plastic canvas flag to glue to your back pack. Backpack Buddies - For good luck this school year, clip a buddy to your back pack and bring it with you on your first day of school. Backpack Buddies - These backpack buddies are perfect crafts for back to school. Kids will love to hang them on their backpack or share them with friends. Beaded Penguin - Everybody loves penguins. This little guy will be happy to tag along on someone's backpack or keychain. Backpack Foamie - Weave foamie beads into a cool decoration for your back pack. Customize it with your own message. Backpack Suncatchers - Use one of our cool patterns to make a sun catcher for your key chain or your backpack. Backpack Nametag - Make a creative name tag you'll be proud to clip on your back pack or suitcase. Backpack Ghosts - This little ghost makes everybody smile. Backpack Baseball Cap - Baseball fans can clip this to their back packs made out of team colors. Backpack Address Book - Terrific for year-end group craft. After completing the project, kids can collect names and phone numbers to stay in touch. Make a great party favour! Backpack Pumpkins - Great party craft, during school or after school. Backpack Octopus - This cute little Backpack Octopus with hang merrily from your backpack and make everyone smile. Backpack Money Holders - Take them to the beach, camping, hiking or to school. These containers will hold money or even a personal first aid kit. Great camp project! Beadie Buddies - Beadie buddies make fun beaded key chains, backpack decorations, mobiles, necklaces, and ornaments at Christmas time. Cowboy Clip - Clip one to your key ring, your back pack or your belt loop before you go out riding on the range. Lanyard Backpack - These are so fun to make, you'll want to give one to all your friends. Lanyard Film Canister First Aid Kit - Hook them to your belt or your back pack! Lip Gloss Holder - Turn old lipstick ends into lip gloss and make this cute container you can clip to your back pack or belt loop. Personalized Backpack Tags - Use fun shrinkable plastic to make personalized or character tags for your backpack, lunch box, umbrella, or even your jacket! Pony Bead Pencil Pattern - You'll want to hook this beaded Pencil on your backpack as you head back to school. Pony Bead Chameleon - Beaded lizard for your backpack. Snake Key Ring - Clip a rattlesnake to your backpack or your key ring. Safety Pin Butterfly - Make beautiful metallic butterflies to clip to your backpack or your key ring. Safety Pin Angel - Combine everyone's two favorite crafts... pony bead patterns and beaded safety pins for a winning angel project. Makes great ornaments or back pack decorations. Watermelon Bead Pattern - Watermelon pattern to hang on your backpack or key chain. Zipper Pull - What's your favorite sport? Soccer, Football, Baseball, Basketball? Make a zipper pull with for your jacket, your sports bag or you backpack.